Did you know about the group of muscles that attach the base of you skull to the top of your neck? They are responsible for a hell of a lot of neck pain and headaches, and very few doctors have any specific training in fixing problems in these muscles. 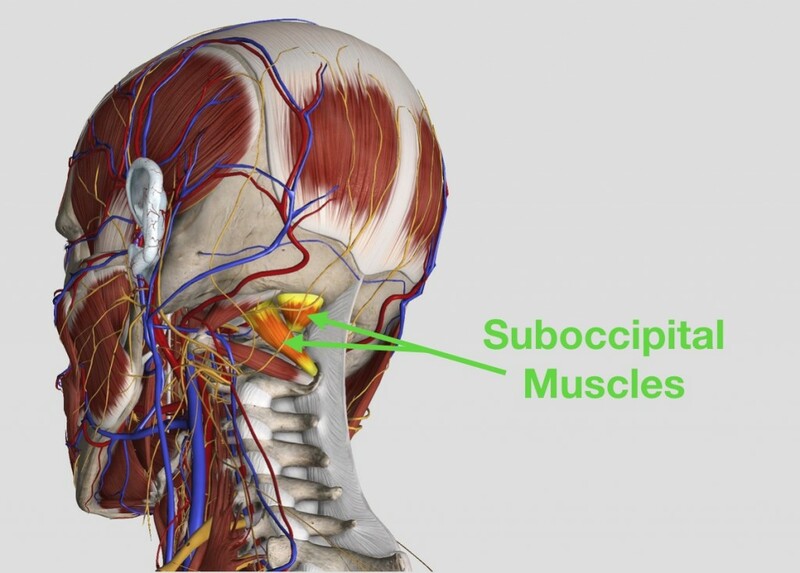 They are called the suboccipital muscles. These muscles are only small but they are probably the most overused and abused tissues in your body. The major load that causes so much damage here is postural habits. When you are in poor positions the suboccipitals get hammered with too much workload. There are endless amounts of postural habits that lead to problems with these muscles. What can go wrong with the suboccipital muscles? Hour by hour the accumulated load builds up in the muscles. When any tissue is overworked there is a certain point at which the healing capacity of the tissue is outpaced by the damaging effects of overwork. It’s a bit like getting a repetitive strain injury (RSI) in your neck. When tissues are irritated and angry over many weeks/months/years the body lays down fibrous adhesion. The adhesion is like scar tissue that restricts motion and causes pain. These are some of the most overlooked pain generators anywhere in the body! Getting them fixed can make such a huge change in neck pain and headaches. Expert specially trained clinicians can locate and apply treatment to the suboccipital muscles. This restores mobility and eliminates pain. Adhesion can be very effectively treated by an expert with special training in manual therapy techniques. I do all of my training with Integrative Diagnosis in the USA. It is a real skill set and there are actually very few practitioners in Australia with this training. It takes years of dedication and continued training to learn how to fix this, they don’t teach this in Universities. If this sounds like what you have been suffering with, and you have found that standard physiotherapy or chiropractic treatments haven’t fixed your problem then you may be a candidate for our comprehensive assessment and treatment plans at Soft Tissue Solutions. Do not hesitate to give us a call on (08) 9756 8420 if you would like to find out any more details or to book yourself an appointment.